The Rio Vista Winery was a gem of a find for us over a very busy summer weekend. Father’s Day weekend is popular for doing outdoors things in the Pacific Northwest. Most schools are out in the days preceding the holiday and the weather is usually at its finest. In fact we found that many businesses in the area don’t really kick off their summer season until the passing of this busy weekend. That’s great if you’re in business in the Pacific Northwest. But it’s not so great if you are searching for a last minute place to park your truck camper for a few days. You often lose track of the big days when you travel full time. You forget holidays, birthdays and even anniversaries. Most days we even lose track of the weekdays. For us, every day is Monday and every day is Friday. But for families in Washington that have been itching to get away for a weekend in the Great Outdoors, Friday is Friday. Sometimes even Thursday is Friday. Because we did not plan ahead too well we found ourselves without a place to camp for the weekend. We were looking for a quiet place leading up to our big trip toward Alaska. This required a place to settle down and rest, make final preparations and maintenance checks on the truck and camper and learn the ins-and-outs of traveling through Canada. Needless to say, we were pretty open to staying anywhere for the weekend. We happened to come across the Spring Canyon Campground in the Lake Roosevelt National Recreation Area on Thursday. A friend told us about the Coulee Dam before we left on our trip. He mentioned the nightly laser light show and the vast availability of camping in the area. But while there were many campgrounds in the area, we could only find a small pull-off campsite meant for tent campers. That is, however, how we travel. Most mornings we wake up and have no clue where we’re going to end up. So at least we knew we could hunker down for the night. Plus the corresponding Roosevelt Park Reservoir was more than enough water to keep Everest happy for the time being. Technically the park is “first-come-first-serve” and guests are permitted to stay up to 14 consecutive days. This is as long as you have exact cash and can “dry dock.” You won’t have power, water or sewer as long as you stay. We had enough of all three to last us a week. Still we didn’t feel so welcome in our tiny little spot. It was almost entirely exposed to direct sun and not very private. Something was missing. So we left, as we usually do when things just don’t feel “right.” It seems someone else was pulling into our campsite almost as soon as we pulled out. Of course they had their boat, fishing poles and life vests. The park has a dump station and fresh water spigot. However these are in a general location near the campground. Sites are completely void of hookups. Additionally you are on your own for power (hopefully you have solar!). You pay by filling out a form and submitting an envelope with exact change. Bring various denominations of cash to pay. Otherwise you’re going to have to round up. The rangers come by each morning to check on things. We subscribe to an organization called “Harvest Hosts” as part of our “travel apps” bundle. It’s a loose affiliation of vineyards, distilleries and breweries across the US that permit campers to boon dock on their property. We usually only pull the app up as a last resort. But we made it our first effort as we were in the heart of Washington wine country. Rio Vista Winery was nearby, an hour drive to just outside a small town called Chelan. To reach the vineyard you have to take a single-lane dirt road off the highway at 60 mph. Needless to say I flew past the entrance. But upon finally making our way down the dirt road into the Rio Vista winery we immediately felt as though we had found a part of Paradise Lost. It truly was a piece of Eden nestled up against the Columbia River. 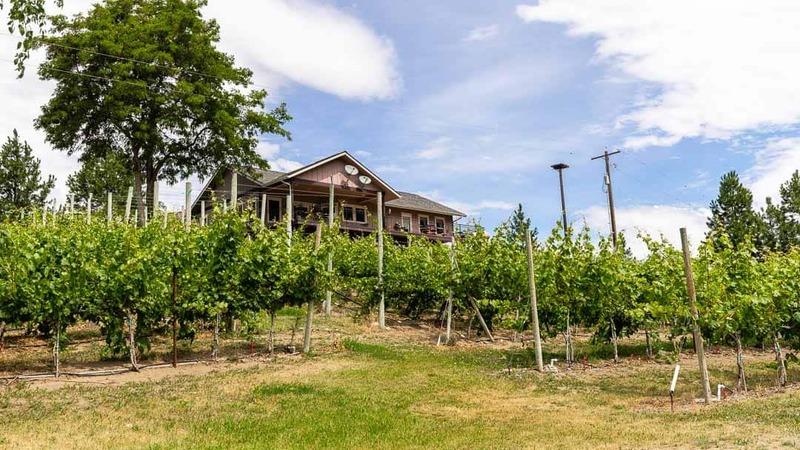 There are 2 dirt roads on the river side of HWY 97 that lead to Rio Vista Winery. One is an entry and one is an exit on an otherwise one-lane road. The entry is the southernmost dirt road. On your vehicle navigation you might pass both roads like we did. 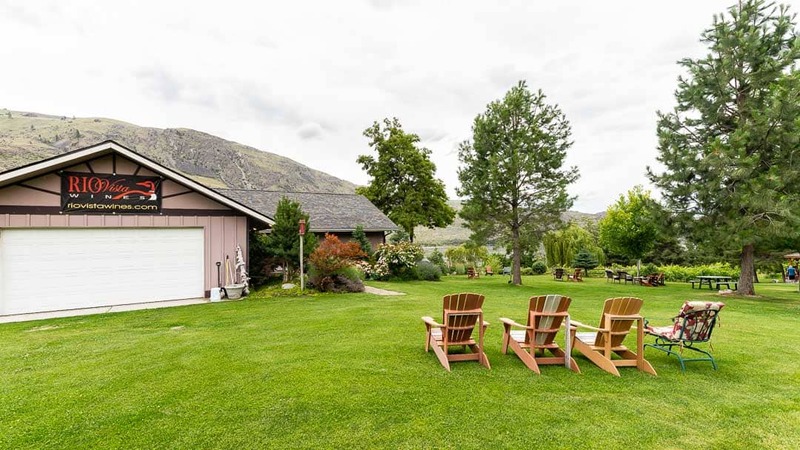 If so, the entry road is the one closest to the town of Chelan. Check out this map first and orient yourself accordingly to save time! I called the Rio Vista winery earlier in the day to confirm our availability. This was our first true experience with Harvest Host. (A previous host in Colorado had canceled on us, so we weren’t sure what to expect.) The owner, John, told me where to park and we’d sort it all out when we got there. He seemed pretty laid back – which is what we needed. I entered the tasting room when we arrived at the Rio Vista Winery and met John Jr. John, his father, was out running errands. John Jr. was just as laid back as his father and we small talked our way to familiarity. He told us to make ourselves at home and that we could stay as long as we liked. We had reservations for a campground in Leavenworth beginning Sunday. So knowing that we could stay at the Rio Vista Winery for at least the next two nights was reassuring. We made our way back into the tasting room after backing the truck beneath some shade and out of the way of the customer parking lot. e wanted to sample some of the wines since we were at a vineyard. Being from Florida, there is not much variety in the local wine selection. You’re usually drinking some variation of Muscadine. But we are not wine snobs so it didn’t matter much what was on the menu. I was just overwhelmed to see that Rio Vista Winery grew, processed and served almost all of the major wines of which most people are familiar. 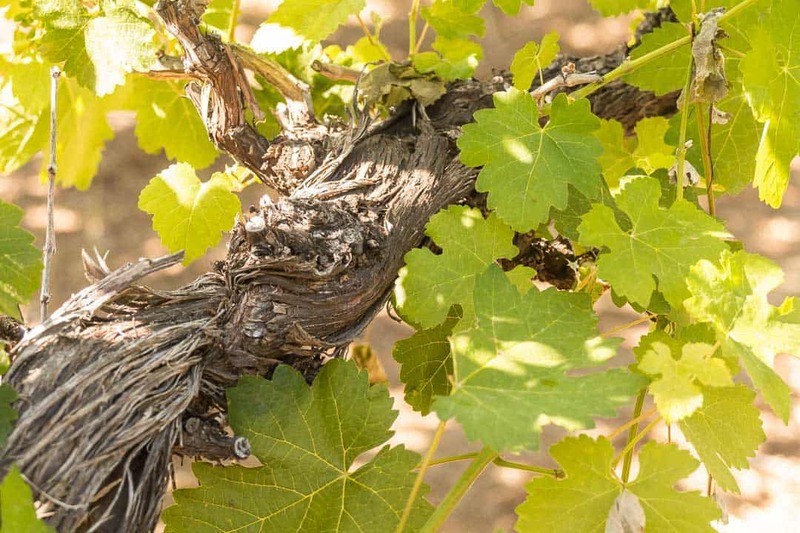 The true beauty of the Rio Vista Winery is in understanding the transformation that took place on the property over the 25 years that John and his wife owned the land. I learned this on our second morning when John motored by on his lawn mower delivering a grill to the patio area of the tasting room. He and his wife lived in a house a few hundred feet from the tasting room so we were guests to his private residence. I quickly jumped into conversation introducing myself and Lindsay. Everest didn’t need an introduction as she said hello by trying to jump on the mower. As we began to talk John told me more of the story of the property. As he spoke I could sense the transformation taking place. The 10-acre property used to be wild. It was cultivated only enough for the small horse pasture that was carved out of the rocks and tumbleweeds around. No crops were under cultivation. The ground was barren and empty. 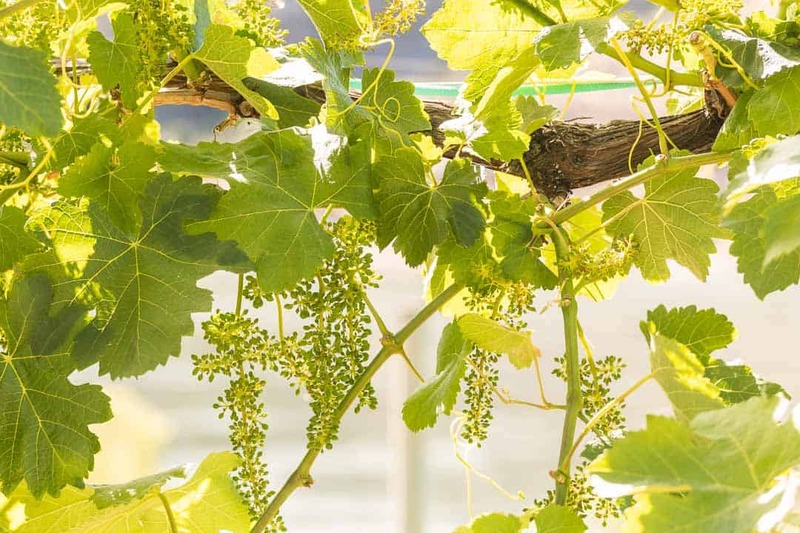 However, beginning in 2000 they planted their first round of grapes and have since continued to bring more acres under cultivation. 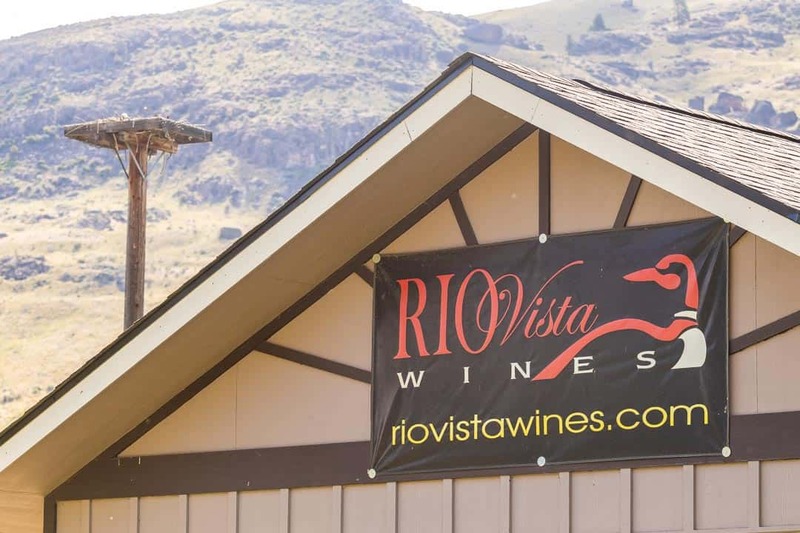 The Rio Vista Winery was one of the first of its kind in the Chelan region. 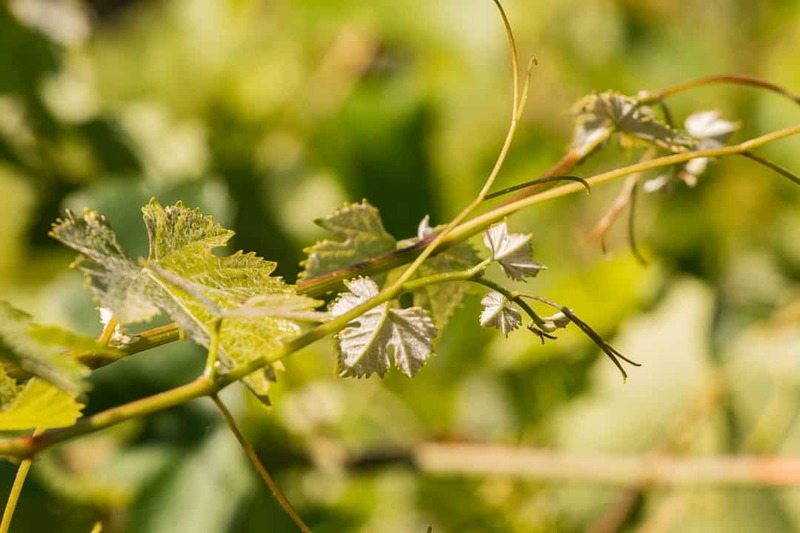 Now there are over 40 other vineyards in the area. 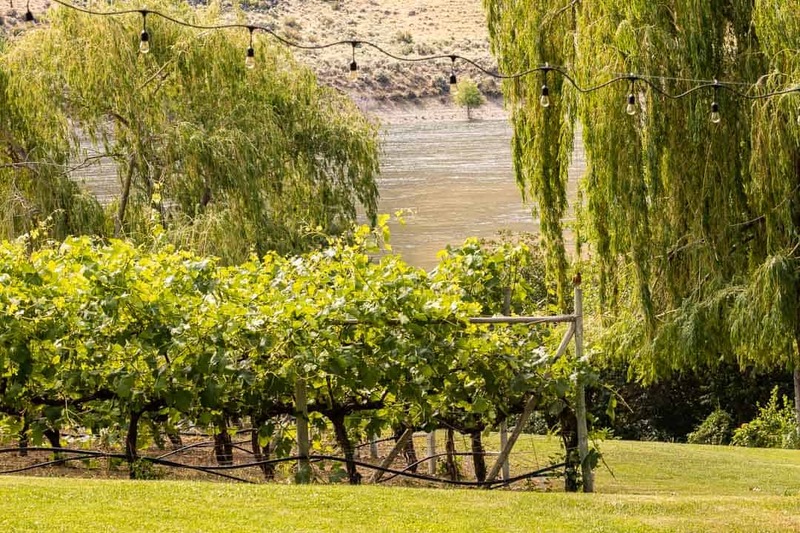 A drive down Highway 97 along the Columbia River confirms that the region is rich in its ability to grow grapes. 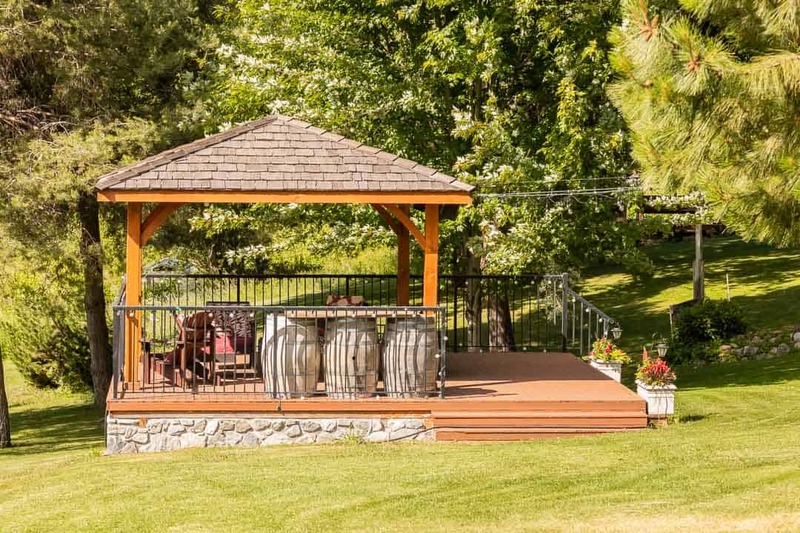 You will also see cherries and apple orchards scattered amongst the grapes in the area. Currently there are 7 acres of grapes under cultivation. You will see that each field is well-planned as you pan your eyes across the property. Neat rows of various grapevines stretch up from the Columbia River below. Dozens of varieties of plants, flowers and trees decorate the acreage and offer homes to many kinds of animals. 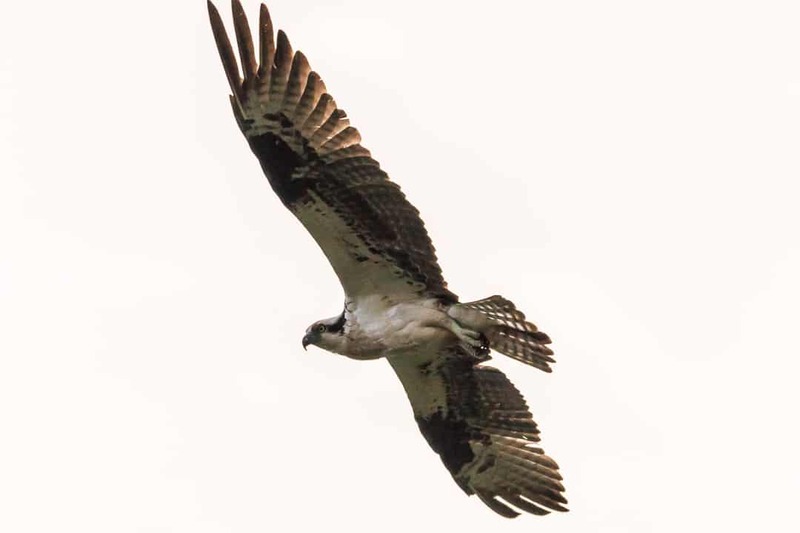 Lindsay’s favorite was the osprey couple and their young chick. I was more a fan of Rocky, the yellow lab host of the winery. We are always looking for opportunities to serve people as we travel. So I asked John if there was anything we could to do help him around the vineyard. I saw a pressure washer on one of the patios and told him that I actually love pressure washing and would love to give him a hand. However instead of accepting my offer John described the work that needed to be done in the vineyard . The roots of some of the older grapes actually tapped directly into the Columbia River. As such the vines did not need to be watered. Instead they grew fast and out of control. The vines will essentially strangle out the new growth if they aren’t trimmed back. I don’t know if John didn’t have the heart to put me to work or if he just got busy with life. But I never ended up pruning the vines. Instead we spent the weekend relaxing on the property. John and his family trusted us as their guests entirely. Once the tasting room closed we literally had the entire vineyard to ourselves. We even looked after Rocky as if he were one of our own, taking him and Everest down to the river various times to swim. We cooked dinner in the front lawn and watched the sun set twice over the river. TO LEARN MORE ABOUT HOW YOU CAN BENEFIT FROM A MEMBERSHIP WITH HARVEST HOSTS PLEASE CLICK THE LINK BELOW!